Clyde "Bud" Perkins, Jr., 77, of Alledonia, Ohio, passed from this earth Wednesday, January 23, 2019 in Park Health Center, St. Clairsville, Ohio. He was born October 5, 1941 near Armstrongs Mills, Belmont County, Ohio, a son of the late Clyde Perkins and Rosalee Keating Perkins Chambers. Bud was a US Navy Veteran and a retired employee of Roose Construction Company. He had also worked for many years for the Y&O and Saginaw Mining Companies. 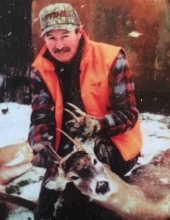 He was a member American Legion Post 768, the Masonic Lodge, Beallsville Sportsman's Club, the North American Hunting Club, the ME-MMA Association, a member of the former Alledonia Grange, and a lifetime member of the NRA. Bud was also a proud member of the "Crunch Bunch Volleyball Team of Alledonia," on which he held the esteemed honor of "Captain Crunch." Surviving are his loving wife of 53 years, Janet Heslop Perkins whom he married on April 2, 1965; four daughters, Tracy (Joe) Kuhn and Beth (Brad) Thompson, both of North Carolina, Kelly Brown of Clarington, and Jennifer (Mike) Frye of Batesville; two brothers, Tom (Alice) Perkins of Shadyside and Jay (Debbie) Perkins of Moundsville; nine grandchildren; ten great-grandchildren; several nieces and nephews, and many, many friends. In addition to his parents, he was preceded in death by his sister, Betty Ann Perkins McClelland. Bud was a man of many talents and interests, but he will be remembered most for his love and devotion to his family and his willingness to help others. Visitation will be held Saturday, January 26 at the Harper Funeral Home, Beallsville from 2pm to 4pm and from 6pm to 8pm where funeral services will be held Sunday, January 27 at 1pm with full Military Honors by American Legion Post 768. Interment will follow in Armstrongs Cemetery. To plant a tree in memory of Clyde "Bud" Perkins, please visit our Tribute Store. Ramsey Ridge Road; Washington Twp. "Email Address" would like to share the life celebration of Clyde "Bud" Perkins. Click on the "link" to go to share a favorite memory or leave a condolence message for the family.